Captivate your audience with these tips. We all have times when we need to communicate technical information to a non-technical audience. Whether your specialist knowledge is in project management, information security or the inner workings of the network, developing your ability to communicate with non-technical audiences will help you in your work and professional career. These six steps should help you bring your message to life. You need to analyse your audience. What do they need to know and how knowledgeable are they? 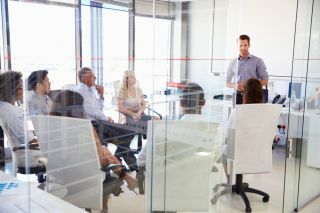 Some areas of the IT profession can be bewildering to the uninitiated, but good presentations solve this by focusing on the audience members’ needs. Think about who will be in the audience. What is their motivation for listening to you? If you have say HR and Finance managers to talk to you will need to present differently to the way you would give the talk to say, member of the technical sales team. Consider building the type of Personas that designers and marketers use to describe their audience. This is an excellent way to help target your message. Getting the structure of your present right is critical. It’s best to think this through before you start up the computer. If you’re making a proposal, then you can begin by describing the problem that needs to be solved, and then the solution you are proposing. A timeline of events can work well when you are giving an update on a project or describing how a problem has come about. Whatever you choose, you should lay out the key points that help your audience understand the message. With this structure to follow you can then pull together supporting material: facts, statistics, analysts’ research. Remember to also include stories and analogies. These will help you to create the emotional connection. Not only will they help your audience to understand your point they will also make your presentation more memorable. For example, rather than “ten DL380s with dual PSUs produces around 34,000 BTUs”, consider, “these servers generates enough heat to make a cup of tea in just 17 seconds. If we didn’t add more cooling then the data centre would get too hot to operate”. You need to get your audience to commit to listening to you within your first 30 seconds. Prepare a strong, bold opening such as "I'm going to show you how we can save 20% on our annual support costs". Write each "slide" on a sticky note as a simple sentence or drawing. For example, "chart showing that ticket volume has increased by 30%" or "picture of a pile of documents". Then arrange them so that they form a logical flow from the beginning to the end. Be clear about what each point means so that the audience doesn’t have to draw their own conclusions. Nancy Duarte, the presentations guru says: "presentations fail because of too much information, not too little". For each slide, ask yourself the question, "does it help this audience understand this message?" If you're not sure, put it aside for use in a different presentation. Remember that these are visual aids to support your spoken message. By the time you're finished you'll have a logical outline of your talk and will be ready to create the slides. Images have much greater impact than text. So look for images that support your points. For free-to-use photos, try unsplash.com, gratisography.com or searching online for "Creative Commons". There are also low-cost photo libraries such as shutterstock.com. Diagrams can be useful for showing relationships and processes. It’s much simpler to understand a few arrows than a page of text. Bear in mind that you and your message are unique, so avoid bland, generic stock photos and clip art. Think about how you're going to share facts and figures. If you're showing a trend or comparison, then a well-constructed line graph or bar chart may be all that's required to make your point. Be cautious when using pie charts though. It's not easy to make sense of abstract angles and it gets worse if there are lots of segments. Unless your message resembles "a quarter of our data loss incidents are due to emails being sent incorrectly", then another method may be better. If you need to provide the detailed data, then make it available through a handout or a follow-up email. I recently saw a vendor pitch with 221 words on a single slide. Yes, I counted. And no, I'm still not sure what their message was. So, use text sparingly and use a large, clear font. Text can be useful for quotes or to emphasise a point that you've just made. There is no substitute for rehearsing. Not only will it make you feel confident if you are familiar with your presentation you will be able to focus on the audience when you get up to present. You don’t want to read a script so having your important points and phrases on small cards that you can use when presenting is a good idea. Alternatively use graphic organisers such as Mind Maps – it’s about finding what works best for you. Remember to avoid jargon in your presentation and if you must use technical words then define them clearly. Keep your sentences short and simple for the greatest impact. You should practice with the equipment you'll be using and if you will be using someone else's equipment such as a projector, make sure you're familiar with how it connects. Take a copy of your presentation on a USB memory stick in case you need to use someone else’s computer. If you are presenting to a large group remember to bring a “clicker” to allow you to move away from your laptop. This is where all your preparation pays off. Settle yourself by taking a deep breath then start with a smile. Nervous speakers often rush through their presentations, leaving their audience reeling. You should pause occasionally to check your audience’s understanding and allow people to ask questions. It is tempting to ask for questions to be kept to the end. However, especially if you have a non-technical audience being able to give clarifications when needed during the presentation can really help. It is also helpful to wait for a few seconds after revealing something on the screen before you start talking again. The psychological research shows that people can’t absorb the visuals and listen to you at the same time. The more presentations you give following these tips the more you will enjoy the experience. Whatever the reason you have been asked to present remember that the most important thing is to focus on the needs of the audience. Make sure your message is useful to them and use language that will work for the specific audience you have in front of you.